With just under a month left here in New Zealand, one of my goals -- "get out stay out" -- is becoming more important than ever. With that motto in mind, the squad and I piled into Ellie's old Rubynator and headed down to the Bay of Plenty and Mount Maunganui for a final, laid-back weekend before final exams roll around. Mount Maunganui lies on the east coast of North Island and decently away from any large cities. With a sweeping view of the waterfront from our Airbnb's front porch, we stayed up and stargazed for awhile. The next morning, we all slowly rolled out of bed to a beautiful sunrise and an aromatic English breakfast cooked by Ellie and Sarah. This was the first time any of us had used Airbnb before. All in all, the place and service were quite accommodating and affordable. The house happened to have an old fashioned typewriter. While I may geek out over photography gear, Ellie geeks out over retro typewriters. English breakfast courtesy of Ellie and Sarah. After cleaning up the house and packing our things, we headed towards Mount Maunganui itself. Mount Maunganui offered sweeping views of not only Tauranga, the neighboring city, but also of the Mount Maunganui Beach and the ocean horizon. It was absolutely gorgeous. After catching the sights from the top, we headed down to the beachfront. Sweet corn fritters at Oceanside Cafe on the Mount Maunganui waterfront. 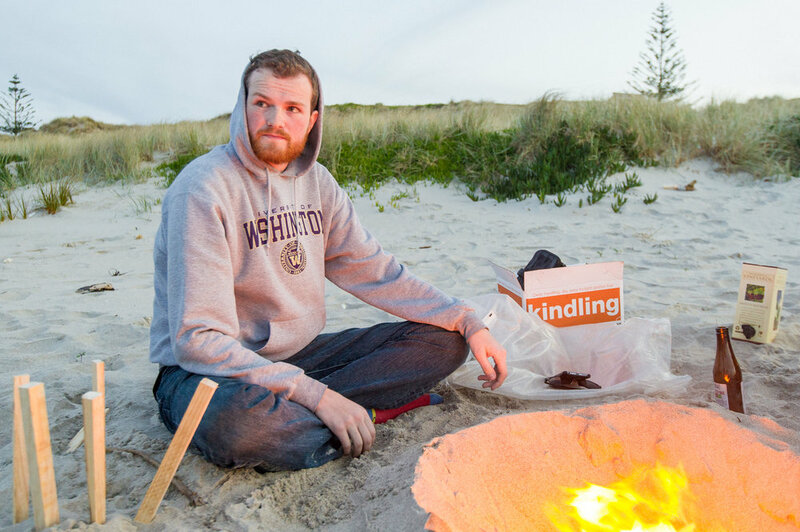 We then headed further down the beach away from the crowds to setup a little campfire and watch the sunset. All in all, Maunganui was an incredible weekend trip.